(Nanowerk News) Researchers have developed a new drug delivery system that allows inhalation of chemotherapeutic drugs to help treat lung cancer, and in laboratory and animal tests it appears to reduce the systemic damage done to other organs while significantly improving the treatment of lung tumors. The findings were made by Oleh Taratula at Oregon State University and Tamara Minko and O. Garbuzenko at Rutgers University and the Cancer Institute of New Jersey. 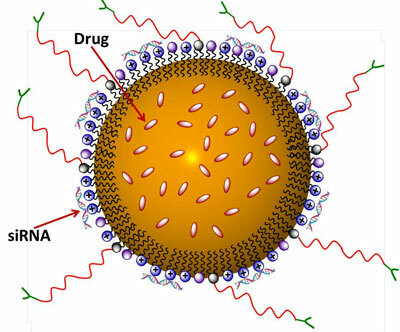 They were just published in the Journal of Controlled Release ("Nanostructured Lipid Carriers as Multifunctional Nanomedicine Platform for Pulmonary Co-Delivery of Anticancer Drugs and siRNA"). This nanocarrier-based drug delivery system may aid in the treatment of lung cancer, bringing both drugs and siRNA into the cancer cell to help kill it. Cancer cells often have two forms of resistance to drugs – "pump" resistance that tends to pump the drug out of cells, and "nonpump" resistance that helps keep the cell from dying. The siRNA used in this system helps to eliminate both those forms of resistance, and leaves the cancer cell vulnerable to the drug being used to kill it. In more conventional chemotherapy for lung cancer, the drugs tend to accumulate in the liver, kidney and spleen, with much less of the drugs ever making it to the lungs. In this study, the amount of the drug delivered to the lungs rose to 83 percent with the inhalation approach, versus 23 percent with injection.